It seems these days that everyone is glued to their smartphones – and thanks to a new concept design by Shikun Sun, an industrial design student at Sheffield Hallam University in England, the visually impaired could be included in this trend. The DrawBraille Mobile Phone is a cell phone that uses a braille board and finger pads that allow the blind to communicate efficiently. And this isn’t any old phone either – the design includes a book reader, text messaging, email, and even music capabilities. The DrawBraille Mobile Phone has two main pieces. The first is comprised of 35 braille buttons in five rows. Since the main keyboard cannot hold the entire braille text, there are also raised “scroll up” and “scroll down” buttons for more options. The second piece is similar to the touch screen on many smart phones, but with a unique raised surface for information input. The user can tap and drag and even create their own shortcuts and words through a combination of commands. The phone’s battery life can be measured on its side, with 5 raised dots each representing 20% of its juice that retract once their percentage is used up. 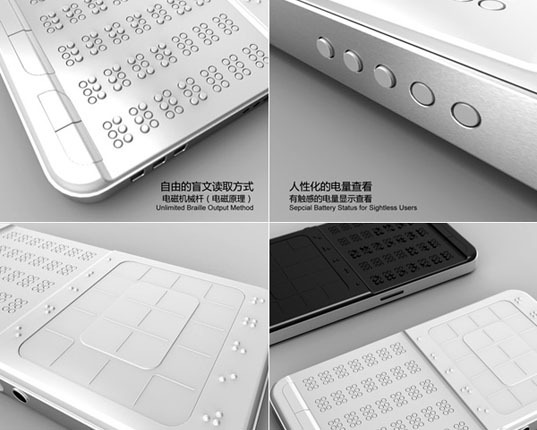 There is no news on the production of this super smart braille phone but the concept alone is getting lots of attention. I will like to know where can I find it and for how much? It seems these days that everyone is glued to their smartphones - and thanks to a new concept design by Shikun Sun, an industrial design student at Sheffield Hallam University in England, the visually impaired could be included in this trend. The DrawBraille Mobile Phone is a cell phone that uses a braille board and finger pads that allow the blind to communicate efficiently. And this isn't any old phone either - the design includes a book reader, text messaging, email, and even music capabilities.